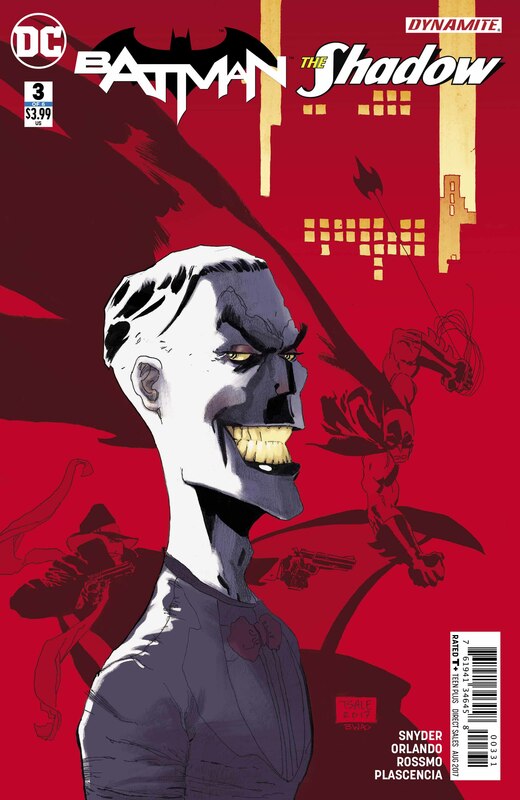 Compellingly written and stupendously illustrated - with an exceptional rendition of the Joker to boot - the third Batman/The Shadow issue is the best yet. 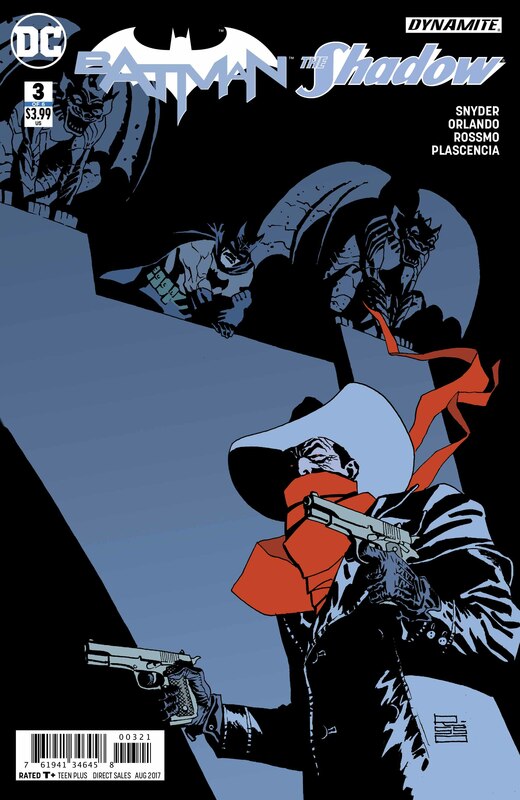 The first issue of the poetically pulpy Batman/The Shadow crossover was good, but the second installment was even better. 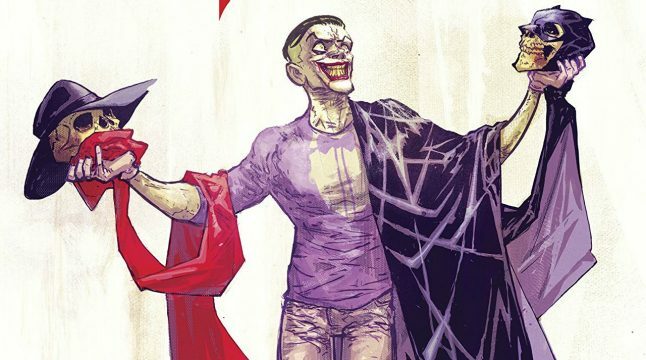 Now, it seems that writing duo Scott Snyder and Steve Orlando are just going to improve things each time as issue three can now be crowned the strongest yet. And it’s probably not a coincidence that it’s the one that features a role for the Joker. The Shadow’s supernatural nemesis the Stag has sought out an alliance with Mr. J, as he continues his bid to kill innocent souls in order to bring him closer to receiving the Shadow’s power source. 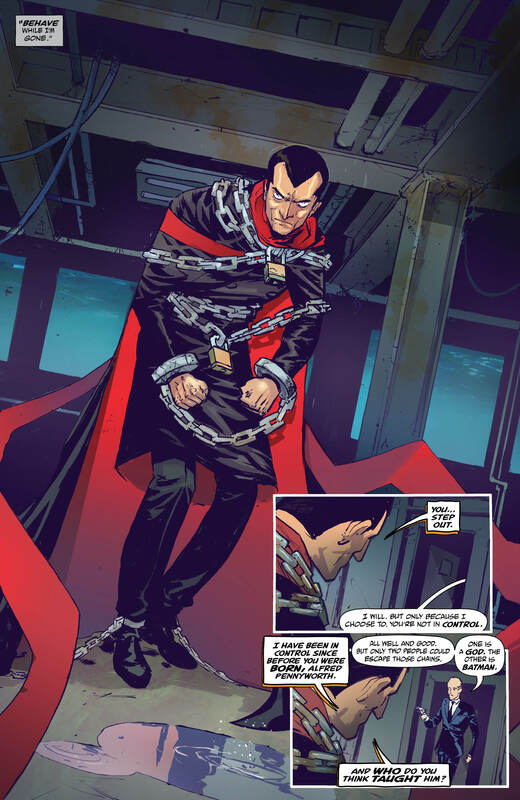 As Batman hunts the villains down, Alfred interrogates the chained-up Shadow and learns of some major revelations concerning the Dark Knight’s past and his destiny. On the good guy side of things, more of Alfred showing his own intimidating, badass side is always a good thing. There’s a clever bit of synergy here with Snyder’s other Batman title, All-Star Batman. 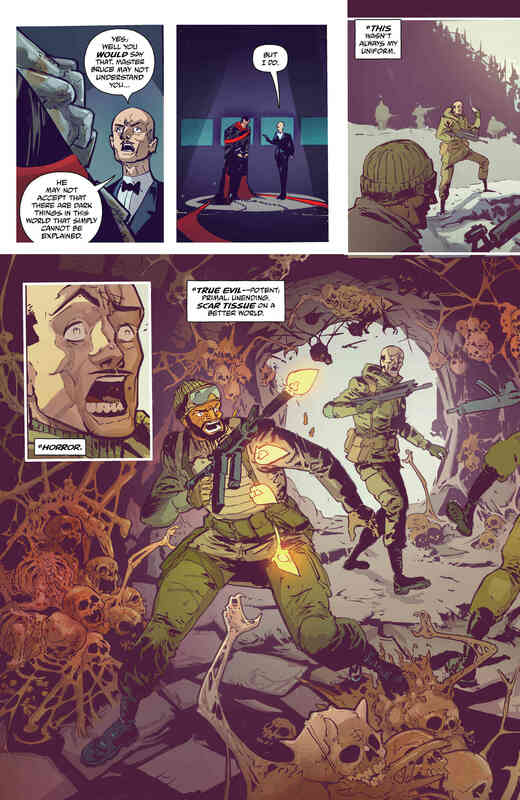 Some flashbacks to Alfred’s military past hark back to what we’re currently learning about the faithful butler in that comic. His discussion with the Shadow leads to some fascinating reveals about the vigilante’s past mentoring of Batman, as well as some hints that his influence on the DC universe might be much wider than we thought. 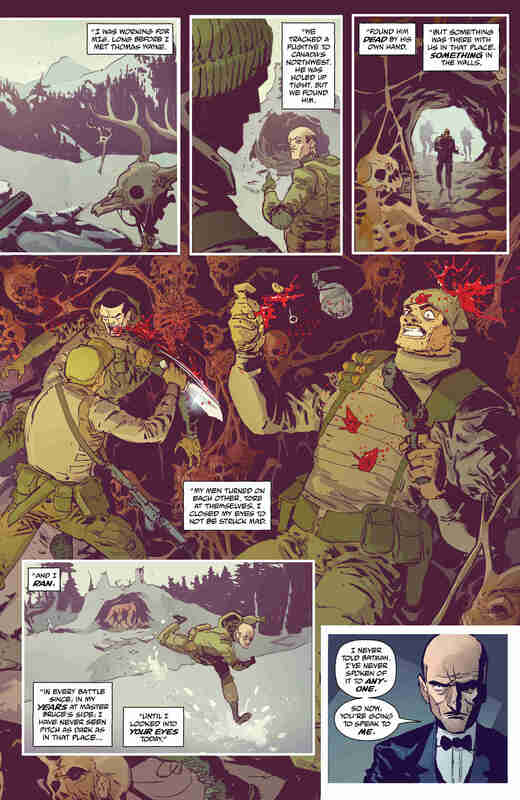 As with the previous two issues, Riley Rossmo’s artwork is just stupendous. With the heavy use of flashbacks and changes of location in this issue, Rossmo – and colorist Ivan Plascencia – practically get to do something fresh every page. 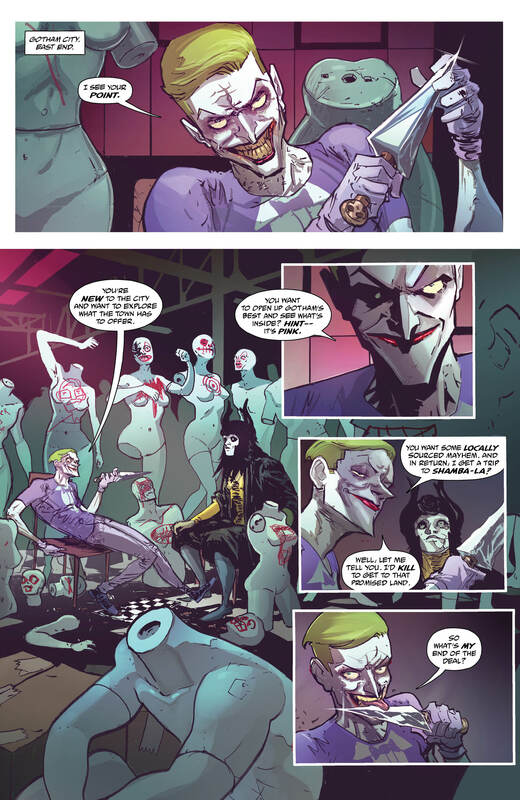 There’s the purple weirdness of the Joker’s warehouse, filled with mutilated mannequins. There’s the blue eerie, dankness of Gotham Harbour. The washed-out green horror of Alfred’s past and so on and so on. The character designs are top notch, as well. In particular, the Joker is a highlight. He’s younger and sprier with a long, gangly frame, which makes him seem like a wilier physical opponent. 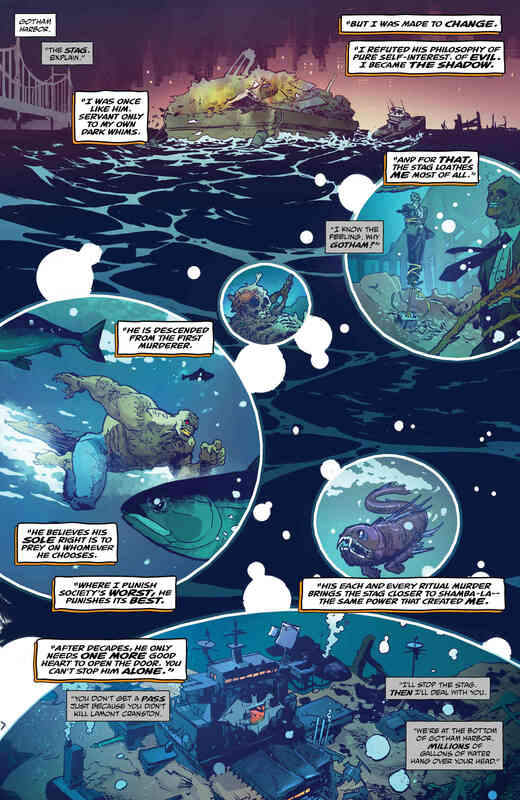 All in all, Batman/The Shadow #3 is a feast for the eyes and the brain. It’s an incredibly well-written and excellently illustrated book that continues to weave a thrilling story that impressively manages to combine the Batman and Shadow mythologies into one coherent whole. 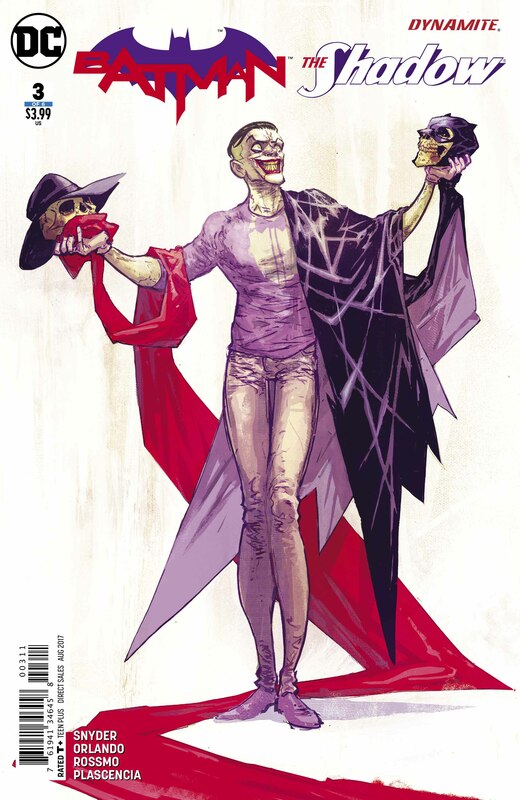 The fact that this issue sports an exceptional rendition of the Joker just sweetens the deal.